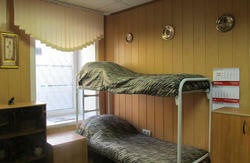 This newly design hostel is located a three-minute walk from the Hermitage, in the heart of St. Petersburg! 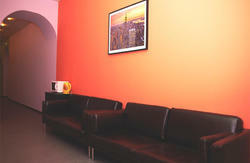 A closer hostel to the Palace Square, you will not find! A warm friendly atmosphere, cozy rooms, meals, excursions, cycling and the opportunity to visit with discounts to many interesting places of St. Petersburg is waiting for you! Taiga Hostel St Petersburg was allocated in creative space 'TAIGA' in which exhibitions, festivals, fashionable shows and meetings with directors and photographers are held. Visitors of Taiga Hostel St Petersburg can take pleasure in the Petersburg atmosphere and get on all actions absolutely free of charge! At your disposal: free wi-fi, tea/coffee and sugar, the filled beds, terry towels, around-the-clock hot water, the hair dryer, the iron, an ironing table, the equipped kitchen, books and logs. The TAIGA Space there is a cafe with tasty coffee, hot pies and fresh salads - of course, at a discount for visitors hostel! To the right on quay Griboedov channel => to Church of the Savior on Spilled Blood (temple Spasa-na-Krovi) => on the left on Konushennaya the areas => quit on Million street => go to Palace quare (Dvortzovaya naberezhnaya) => on the right: Palace quay (Dvortzovaya naberezhnaya) , the house №20 => Taiga Space! To the right on Palace quay (Dvortzovaya naberezhnaya) to the house №20 => Taiga Space!